the 4DTV has (at least up to version 06D) a limit of 1,920 entries in the Transponder Data Table. (A.K.A. TDTs). Consequently, the problem has arizen that the TDT table is reaching its limit. This problem is known as "the TDT Overflow Problem"
The middle of the top line is the TDT count. If it is 1920, you have reached the limit. For everything that goes in, something must come out. Too often it drops something important, like G0. b) you cannot download new maps or satellites. c) satellites disappear (G5, G0, G9, W2, K5) from the menu. 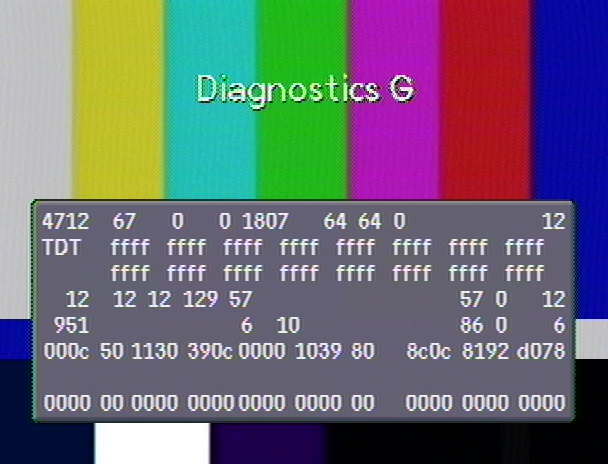 2) The Case of the "Dirty Digits"
The 4DTV can accept channel maps from any DCII service that broadcasts them. All officially mapped DCII channels are supposed to broadcast good maps. HITS, PCTV, TVN and the late Telquest have all goofed up the maps. The root problem is that not all maps are synchronized between broadcasters. This is most pronounced on un-mapped compatible services. These may change the definition of channel frequencies, or add or remove satellites from the receiver's memory. There was a case once where some bad maps caused all Showtime channels on Galaxy-9 to be mapped to ESPNNEWS. for at least 30 minutes to get new maps. The important thing is to make sure the green light on the unit's front panel designating DCII is lit. b) Do the above activity, but before doing so, Unplug the 4DTV from AC Power and Plug it back in. It only needs to be unplugged long enough to go into WM UP before returning to normal operation.